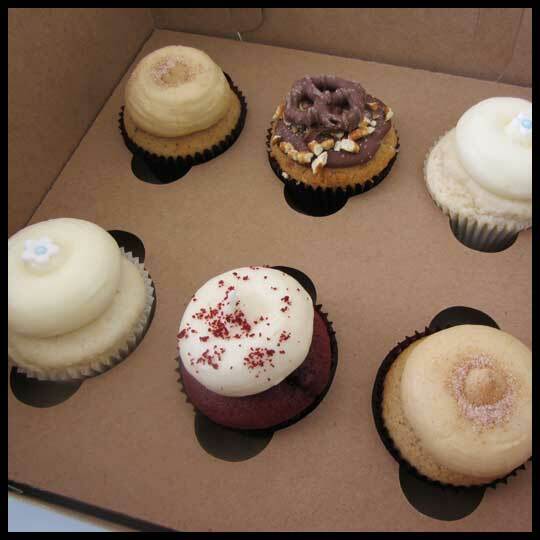 By the time we got to Frosting, A Cupcakery in Chevy Chase MD, we were all ready for another cupcake, since we weren’t able to eat any at our previous stop, Georgetown Cupcake. 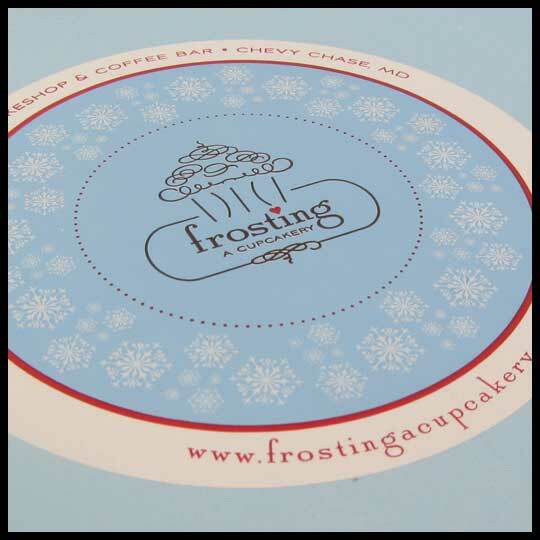 Frosting is a cute shop on the corner of Wisconsin Circle and Western Ave NW. 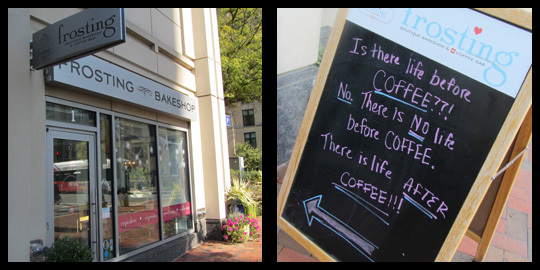 (Being the coffee lovers that we are, the 3 Cupcake Crusaders loved this message on this sign board). I think both Jenn and Elisa will agree with me when I say that this was the best decorated shop we visited all day. 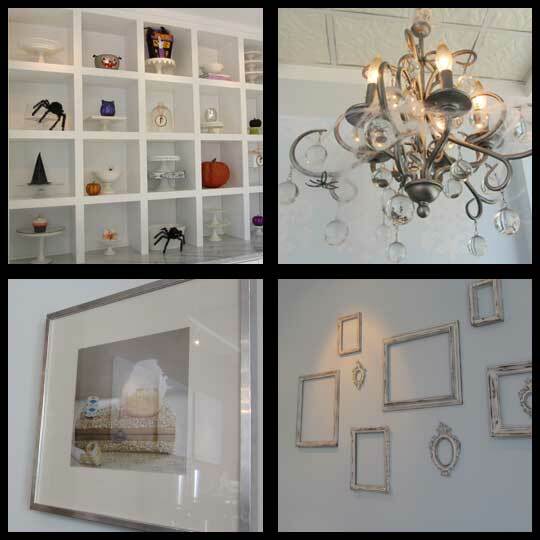 We all loved the built in shelves displaying a variety of cake and cupcake stands with touches of Halloween decorates throughout. There was a chandelier hanging over the booth (yes, they had a booth that you could sit and eat your cupcakes in) that was also decorated for Halloween. Although, I think my favorite had to have been either the wall that was lined with amazing cupcake photography or the frame wall (which I’ve been planning to do in my own home. Just need to hang all the frames I have). 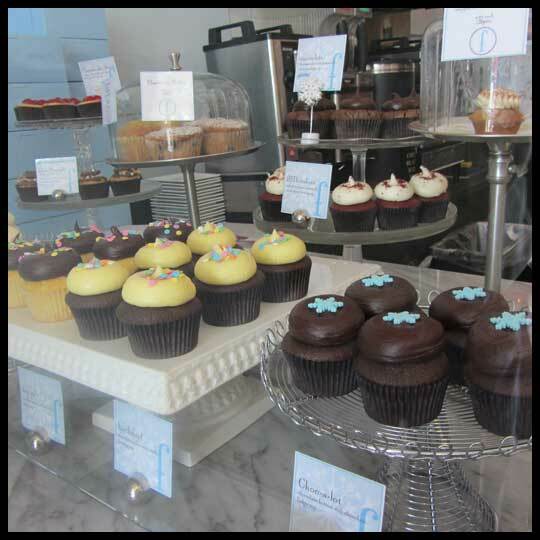 Their cupcakes were decorated just as well as their little shop, and actually had the same “feel” as the interior decor. Simple elegance is the best way I can think to describe it. Elisa and I chose: 2 Frenchies, 1 REDiculous, 1 Elvis Pretzely, and 2 edelweiss. 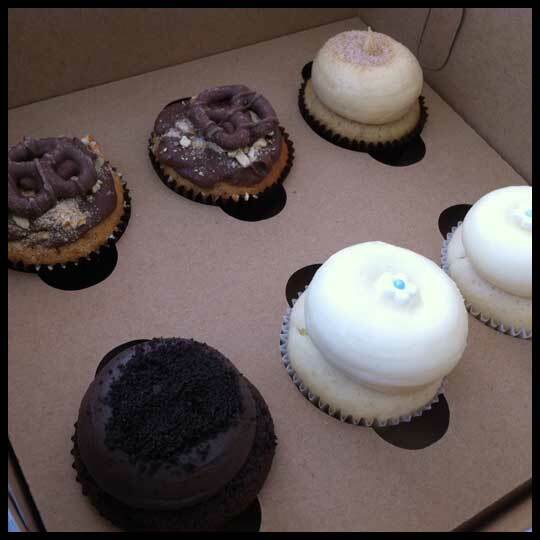 Jenn and her husband, Dan, chose: 2 Elvis Pretzelys, 1 Frenchie, 1 Cookie MOMster, and 2 edelweiss. This was the one that I decided to eat while there and OMG, it was good! I’m sucker for anything maple, especially in the fall, and this really hit the spot. I honestly wish I had gotten another one to take home with me. After trying an assortment of cupcakes when we all got home, Jenn said that she thinks that the Frenchie is probably her favorite one from Frosting. 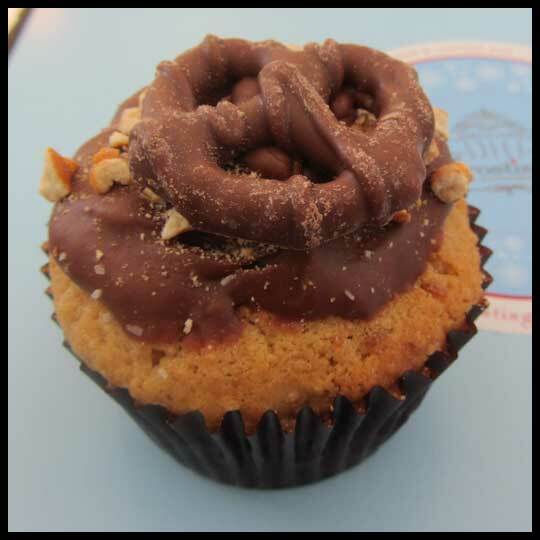 Elisa had her’s the next day for breakfast (becuase let’s face it, it IS basically breakfast in a cupcake form) and said, “The cake actually tasted like French Toast – YUM! The icing was just as good with a sweet and true maple taste. I love all things french toast, so this is my 4th or 5th ‘french toast’ cupcake… and it is my favorite.” Being the bacon lover that she is, she thinks that if there was bacon on top it would have sent this cupcake over and above, but for me, the non-pork eater, I’m really glad it didn’t have bacon on it because then I would have missed out on one seriously good cupcake. 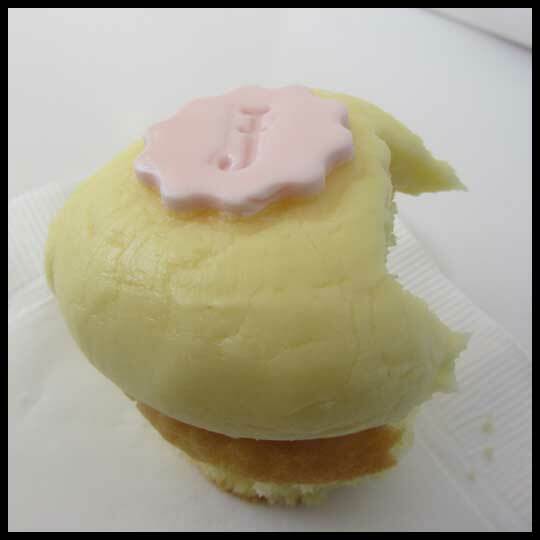 Jenn had this cupcake while we were there. She liked it and said that it was very almondy, and that the cake was really moist, but that since it was so sweet she was glad it was the last cupcake she ate that day. Elisa and I tried each of ours later at home, and I thought that it was sweet, but not the sweetest I had gotten that day. I loved that it was so full of almond flavor, and even my husband, Mr. Non-Cupcake Man (that might be his new nickname…) really enjoyed this cupcake. I think that he was actually sad that he had to share it with me. Elisa was pleasantly surprised becuase usually when something says almond it just kinda tastes like almond, but this was jammed packed with almond flavor. She did say that she would have loved the addition of a raspberry filling but mainly becuase she loves almond and fruit flavors combined. Two other cupcakes that aren’t pictured in the group shots above are the Pumpkin Teenie that Dan got, and the ‘nilla ‘nilla that my dad got. My dad usually enjoys the basics. I don’t normally get vanilla or just chocolate, but he really enjoys the classics, so it’s nice when he’s around and I can take a bite of the classics too. 🙂 He said that he really liked this cupcake, but that his favorite stop of the day was still Fancy Cakes. 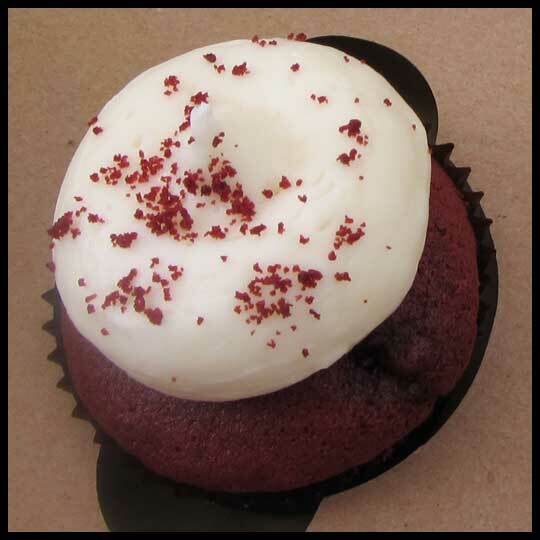 Jenn and I both had this cupcake, and we totally disagree on it. Like, total opposite ends of the spectrum. She feels that it was her least favorite of the entire trip because the pretzel inside the cake took on a stale texture and the chocolate ganache wasn’t chocolatey enough to give the whole thing a chocolate covered pretzel flavor. 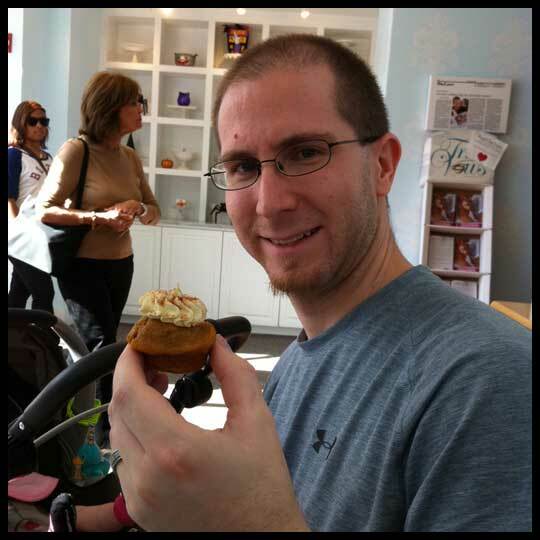 I, on the other hand, really enjoyed this cupcake. I’ll admit when I first saw the cupcake I almost didn’t get it becuase there wasn’t a lot of ganache on the top, and then when I bit into the cupcake, the softness of the pretzels threw me off a bit, but by the end, I was sold. The cake was moist, the small chunks of softened pretzel blended into the cake, the ganache on the top was soft and wasn’t overpowering the pretzel flavor, and the salt and sweet combo stood out above everything. This cupcake was a little messy to eat, especially when you reached the chocolate covered pretzel on top, so I wouldn’t recommend it for a party, but in front of my desk, I don’t care how messy it is as long as it taste good. 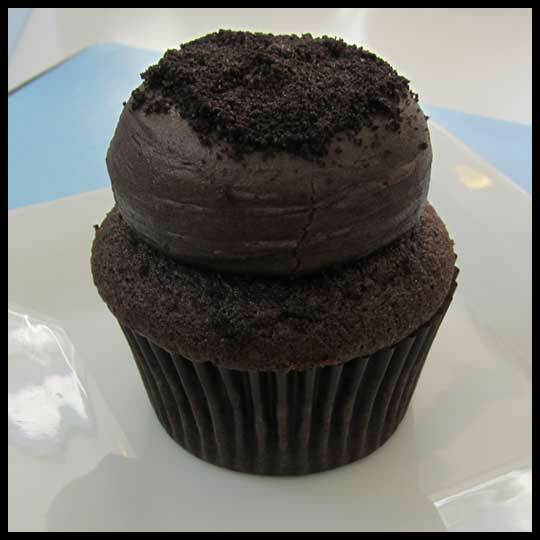 Jenn thought that overall the almond flavor overpowered the chocolate and that from looking at this cupcake it looks as if the chocolate would come first, with the almond a secondary flavor, but that it almost tasted just like their edelweiss (almond/almond) cupcake. She also said that it seems like the only place the “cookie” (Oreo) comes into play is with the chocolate cookie crumble on top. 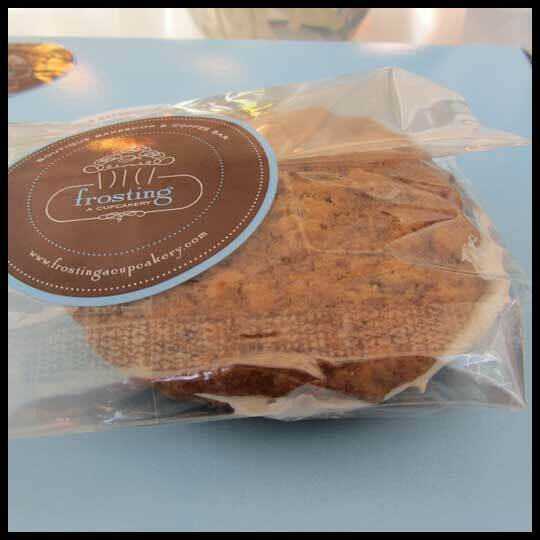 While we were there, Elisa decided to purchase an Oatmeal Cream Pie that they made there (becuase let’s be honest, who doesn’t love an Oatmeal Cream Pie?) and it was awesome! Overall we had a wonderful experience at Frosting. 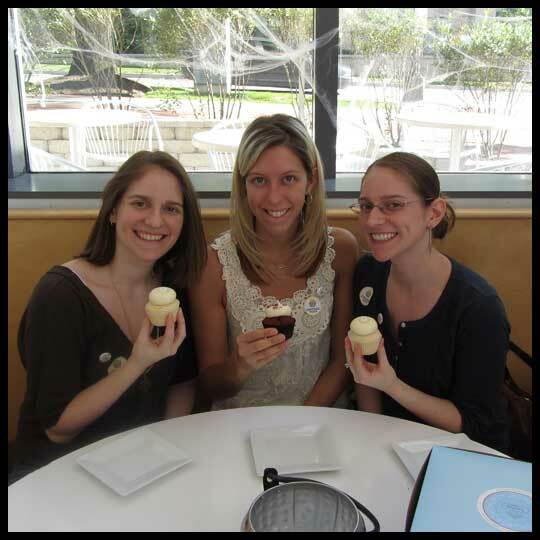 The staff was really friendly, the environment was beautiful and relaxing, and the cupcakes were top notch. 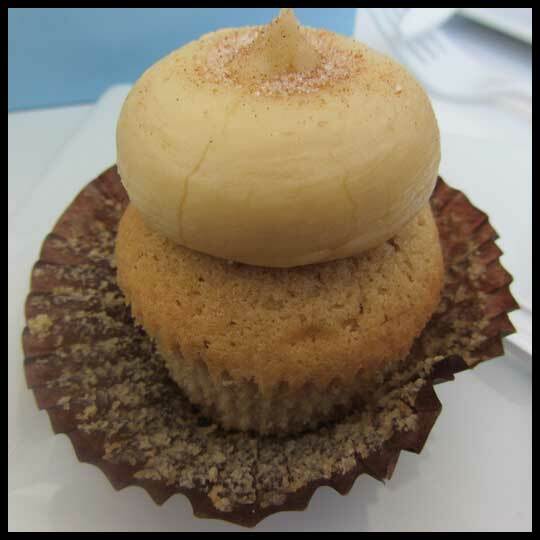 This entry was posted in Cupcakes, Maryland and tagged 2011 Cupcake Tour, Almond, Chevy Chase, Chocolate, cookies and creme, Cupcake, french toast, Frosting, Frosting Cupcakery, Pretzel, pumpkin cupcake, Red Velvet, Tour, vanilla by Stacy. Bookmark the permalink. I just wanted to add that Dan hasn’t had the Edelweiss, so I’ll leave a comment after he tries that one, probably tonight. Also, he and I disagreed on the MOMster. He really liked it a lot and didn’t think the almond flavor was too much, but again, he hasn’t had the Edelweiss yet. And he did agree with me on the Elvis Pretzly. We have another one of those to eat tonight, so if I feel differently after a second tasting, I’ll let you know. 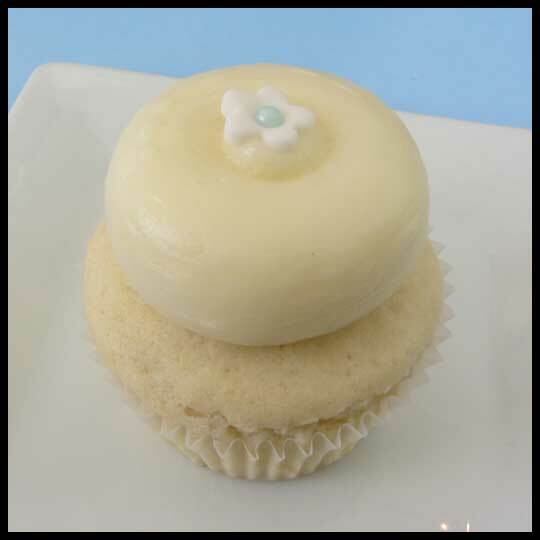 And lastly, just a tip, if it looks like there is only one cupcake of a particular flavor left but you need more, be sure to ask about it because they may have some in the back that are ready or almost ready to come out. Thank you! I’m so glad you enjoyed it! You many actually want to read the review. It got VERY mixed reviews between Jenn and myself. I liked it, her and her husband didn’t.